Let you find any Outlook folder by typing just a few keystrokes. Perform an action on that folder (such as File Message, Go To Folder, etc.) with one additional keystroke. When the QuickPick window opens, it will list all your folders, which can be a very long list. You can see on the lower-left corner of the above screenshot that QuickPick started with 12620 folders. Trying to scroll through all of them looking for the right folder would be futile. There is a much faster way. In the screenshot above, you see two word fragments in the search field: cont and acm. The first word cont matched all folders with words such as Contracts, Contacts, etc. The additional search term acm narrowed that list down further to display only the folders that matched both. In this example, there was only one match out of 12620 folders - \Inbox\Clients\Acme\Contracts. (cont matched Contracts and acm matched Acme). Remember, the QuickPick folder list is optimized for quick navigation using the keyboard. In most cases it will be much faster than trying to scroll the list with your mouse. Hotkeys along with the QuickPick make SimplyFile perfectly optimized for fast keyboard-based operation. If you need to scroll the list of folders to select the right one (for example, when you typed a few letters and several folders matched), you can use Ctrl+K and Ctrl+J in addition to Up and Down arrows. This allows you to scroll without moving hands from the Home position. Alternatively, you can always type more space-separated search terms to zoom in on the right folder. By default, QuickPick does not list Public Folders. You can enable them using the corresponding command, located under the More Actions menu. Once you find the folder, you can perform the following commands. File the message(s) which you have highlighted prior to opening QuickPick in the selected folder. Open the selected folder in Outlook. File Message and Go To Folder in one operation. Create a new folder under the folder highlighted in the folder list. In the screenshot above, the new folder would be created as a subfolder of \Inbox\Clients\Acme\Contracts. Shift+Click this button to open the standard Outlook “Select Folder” window instead of SimplyFile’s “Create Folder”. File all messages with the same subject as the message you have highlighted before opening QuickPick. 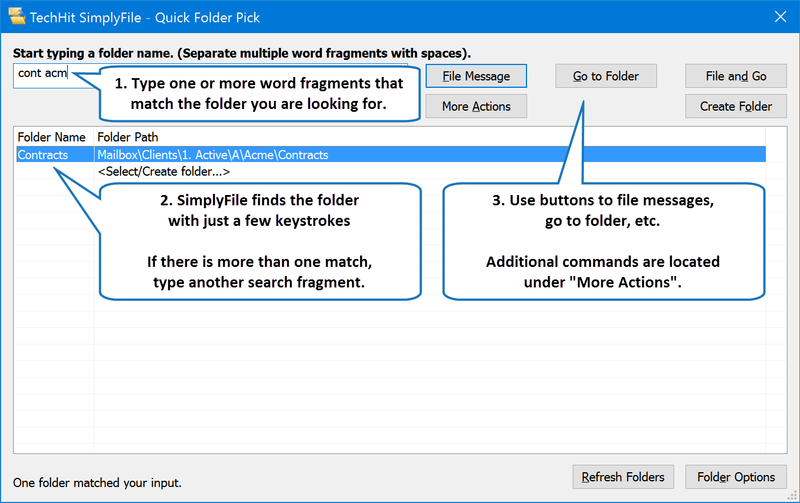 File all messages from the current folder which were sent by the same person as the message you have highlighted before opening QuickPick. File the message and print it on the default printer in one operation. Display Exchange Public Folders in the QuickPick folder list. Display folders from Exchange Delegate mailboxes in the QuickPick folder list. If you recently created a new Outlook folder and do not see it in the folder list, click Refresh Folders to refresh the list. Open Folder Options Window for the currently selected folder. Every button in the QuickPick window has a keyboard shortcut, so you can activate it without touching the mouse. To trigger a button using the keyboard, press the Alt key, then press the letter underlined on the button label. For example, for “File Message”, you would press Alt+f.